Many people, especially fisherman, have heard of “turnover,” which occurs when lake water mixes from the surface to the bottom. Less well known is what is happening during the rest of the year. When a lake isn’t “turning over” it becomes stratified. A volume of water is heaviest at 4° Celsius (39.2° F), just above freezing. 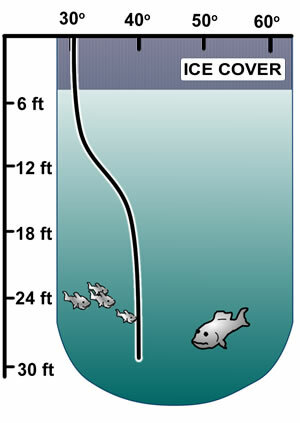 The same volume of water becomes lighter as it warms and rises to the surface, leaving the colder water at the bottom (except in winter—see below). As the sun continues to heat the water at the top, the difference in temperature (and density) between the top and bottom water becomes greater. Eventually there are 2 distinct layers, the epilimnion at the top and the hypolimnion at the bottom. Between these 2 layers is a third, less distinct, transition layer called the metalimnion. These layers generally hold until autumn, when the surface water cools. 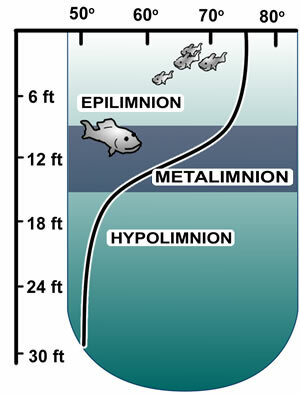 Often in the summer, the hypolimnion will become depleted of oxygen. The bacteria responsible for decomposition consume the oxygen and access to atmospheric oxygen is cut off by stratification. One would assume that if water becomes more dense as it gets colder, it should freeze from the bottom up. As explained earlier, however, water is most dense at 4° Celsius (or 39.2° F), which is warmer than freezing. So as water continues to cool from 4° C (39.2° F), it becomes less dense and rises to the top, leaving the slightly warmer water below. At the surface, the cool water is exposed to freezing air temperatures and may eventually freeze. Once ice forms, the water beneath cannot be mixed by the wind. When the ice melts in the spring, the entire water column will be at approximately 4° C for a brief time. The lake will mix thoroughly (“turnover”) with just a bit of wind. A calm, warm day can heat the surface water and initiate the stratification process. Stratification may also occur due to changes in salt content as well as temperature. Oceans, particularly in places where freshwater enters, may be stratified by salinity. The problems with Gulf Hypoxia may be attributed partially to the inability of the dense and salty bottom water to mix with the oxygen-rich, less salty water above.